Nothing in my hand, nothing in my hand. Click here to play! Abracadabra and POW! There you go! A real money prize. 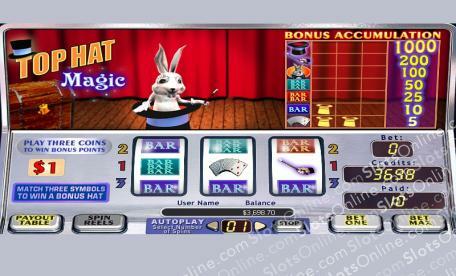 There's no trick to it, it's just a normal part of playing the Top Hat Magic slots. Pull cards, wands, bar symbols and bunnies out of the hat, and some prize money will soon follow! Match up the symbols and win points. Get 3 of the same symbol 3 times, and you could win bonus coins. Who cares about pulling a bunny out of a top hat when you can pull out bonus prize money instead? Fall under the spell of the Top Hat Magic slots and prepare for a magic show that will excite you more than any other. This game has a bonus feature where bonus hats are earned every time 3 qualifying symbols are matched on a single payline. When 3 bonus hats are earned on the same symbol, as bonus prize is paid out.